We welcome talented people to join our team. Find out more about what we offer and the skills and qualities we are looking for. Our offices are situated between the business hubs of the City and Canary Wharf, within easy reach of the schools we work with – not forgetting minutes from the buzzing areas of Spitalfields and Brick Lane. 5% pension contribution and 25 days per annum plus bank holidays. Additional Christmas/New Year office closure and discretionary additional holidays. Staff are actively encouraged to undertake learning and development opportunities through external courses or in-house development opportunities. We encourage employees to apply for job vacancies that come up to develop their career and skills. 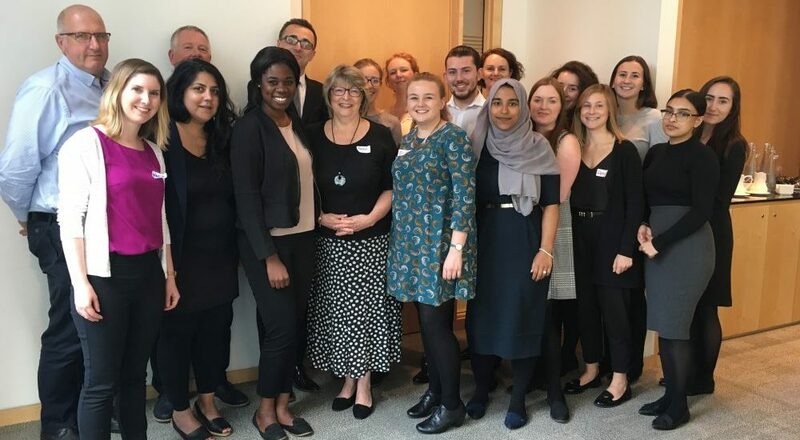 Our annual Learning at Work Week has included highlights such as a tour of Brick Lane, briefing from a think tank on employability trends, and a tour of Lloyd’s of London insurance market. Energetic – you will have drive and enthusiasm to help us deliver fantastic programmes for young people and maintain pace and momentum. Friendly – you will enjoy getting to know the brilliant schools, teachers, volunteers and company co-ordinators who we partner with. Professional – you will inspire confidence in people at all levels in business and schools with your excellent manner and communication, as well as your ability to do things well, see things through and deliver results. Keen to develop and grow – you will be keen to develop yourself and our organisation and be willing to adapt and make the most of new opportunities as they arise. Does this sound like you? Have a look at the current job opportunities we have available. Our jobs take us out and about all the time – follow us on Twitter to see what we’ve been up to recently.